Last summoning. 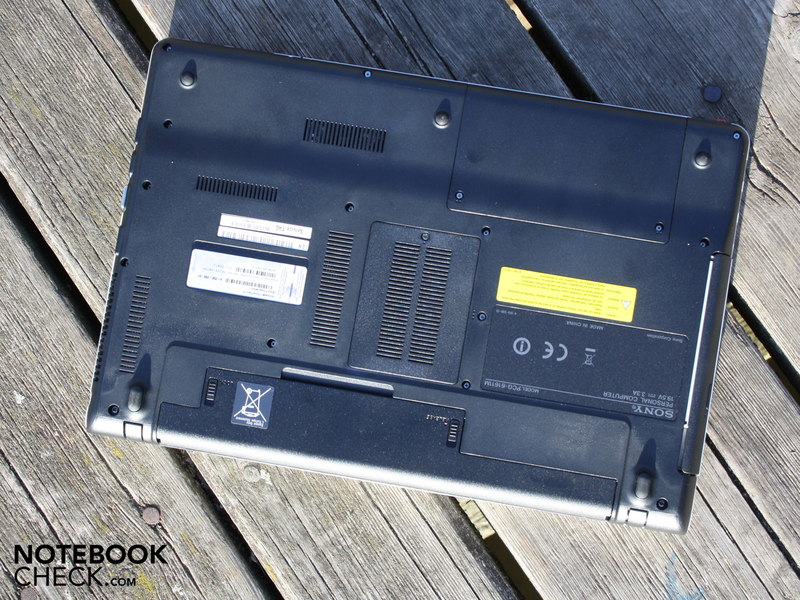 When an Athlon is found in a laptop, it can only be an low-cost entry device. 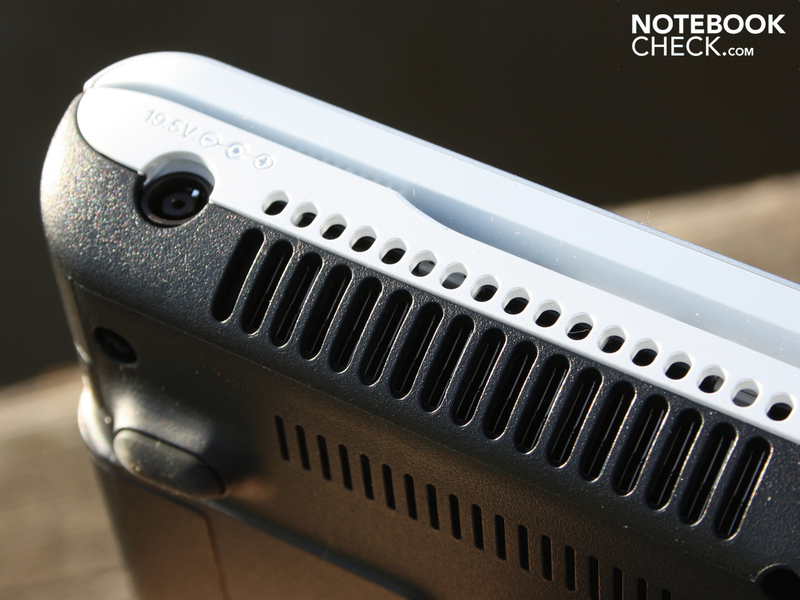 Find out in this review why it's still good enough for a "good" despite weak performance and poor TFT. 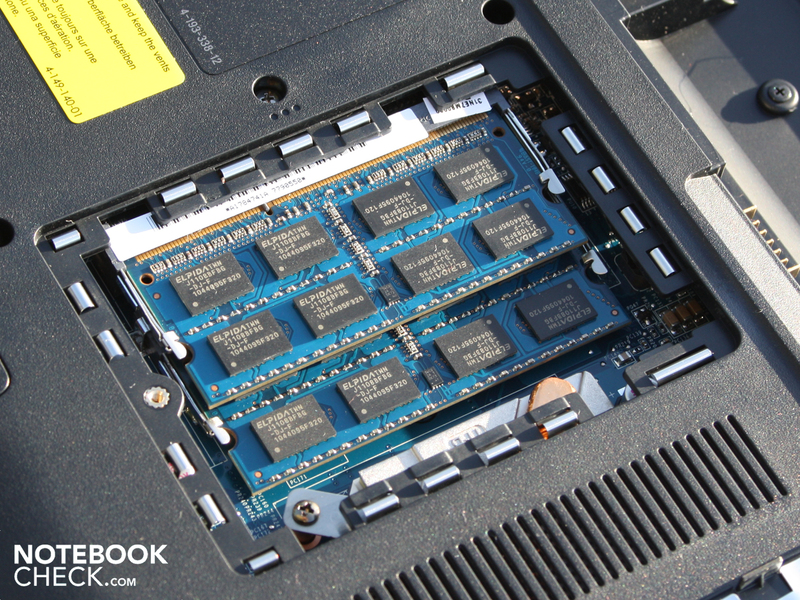 AMD processors in notebooks aren't a rarity, but to find them in a test device only happens every few months. The reason: Apart from the netbook platform, Fusion, AMD has thrown out the old CPUs from the beginning of mid 2010 (Phenom Mobile). And these cores have been clearly left behind by Intel's Arrandale and Sandy Bridge generation in the meantime. 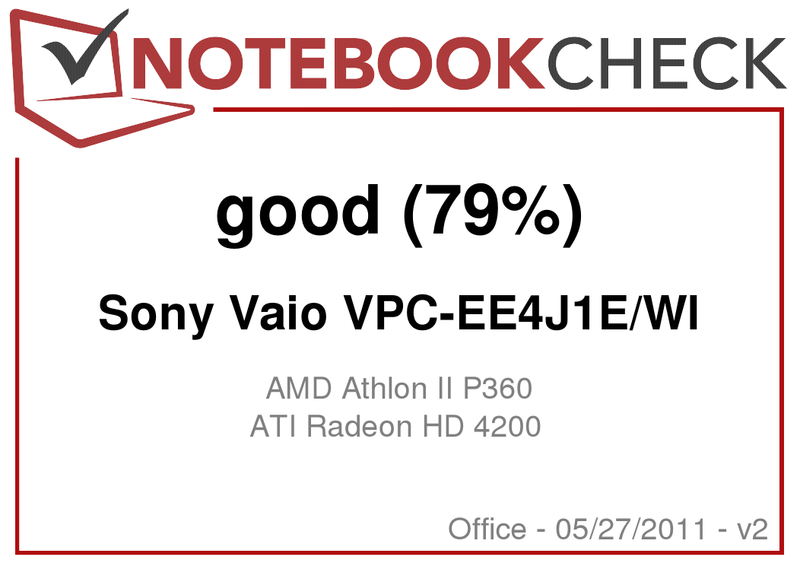 So, when a test Vaio with an entry CPU, Athlon II P360 (2x2.30 GHz) now turns up, then it's primarily because of the attractive price design. Sony Vaio VPC-EE models with this (or similar) AMD CPUs are available for starting at 450 euros. Out test device, the VPC-EE4J1E/WI, is found in the virtual shelves for starting at 528 euros. The performance debate is a part of the review, but it won't dominate it. 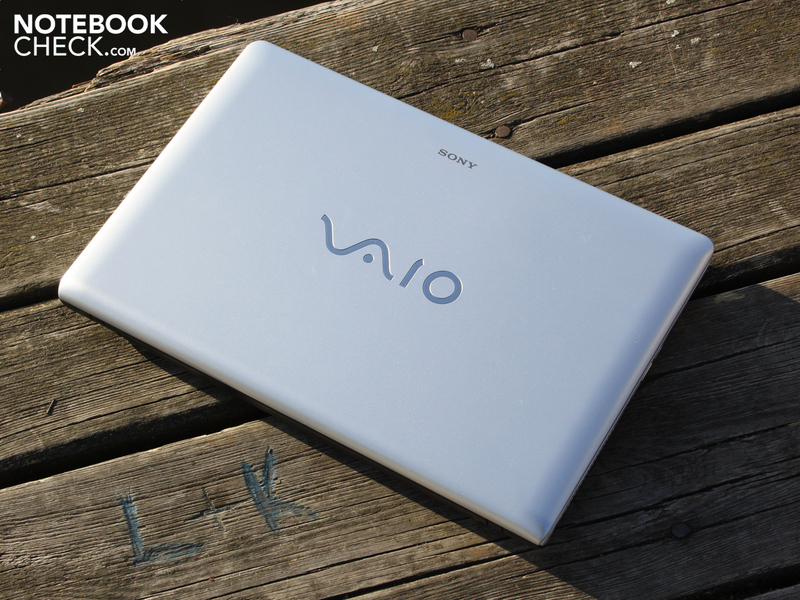 More interesting is how much practical suitability the customer gets for his money in the Vaio. In which field is the EE4J1E better, office or multimedia? All answers about the stylish Vaio in snow white can be found in this review. Matt silver outside and elegant snow white inside. 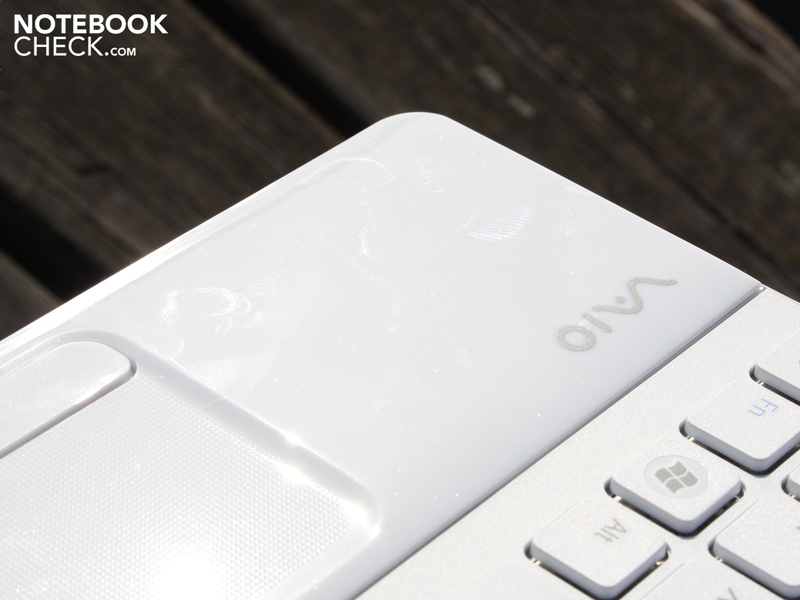 The Vaio EE4J1E/WI poses for our camera in this attractive, but smudge-sensitive look. A wrist-rest, which gives the impression of being made of smooth china (plastic), begins. The milky white surface has a glittery effect. It starts to sparkle in the sun. The slippery wrist-rest is soon covered with fingerprints, but they remain almost invisible. It continues with a silver bar that conceals the speakers and has the Assist and power button. The lid is kept in place by two small hinges. They have a good grip, but teeter during adjustments. The display's maximum opening angle is about 135 degrees. The lid's sunken lower edge is a weakness resulting from its design. It doesn't touch the table's surface, but the silver coating slides over the table surface when it's lifted at the front. Ugly scratches will soon be the consequence of this. The stability doesn't benefit from the lid despite its thickness. We can bend the lid to an extent when we pick it up at its corners. It can also easily be dent in the center. The case isn't any better. The front part makes a robust impression. The bulky wrist-rest doesn't yield anywhere. However, you'll notice the weak torsional stiffness when you pick up the base unit. In particular, the optical drive stands out as a construction weak point. 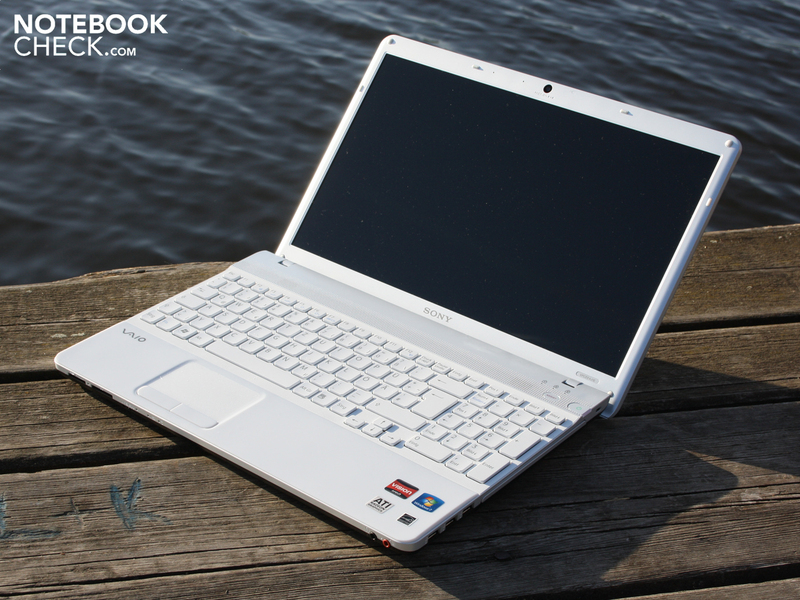 Nevertheless, the Vaio notebook's construction is adequately stable and corresponds to the minimum standard of low-priced laptops. If you put a lot of value on robustness, you'll be disappointed. The user shouldn't be too demanding when it comes to interfaces. 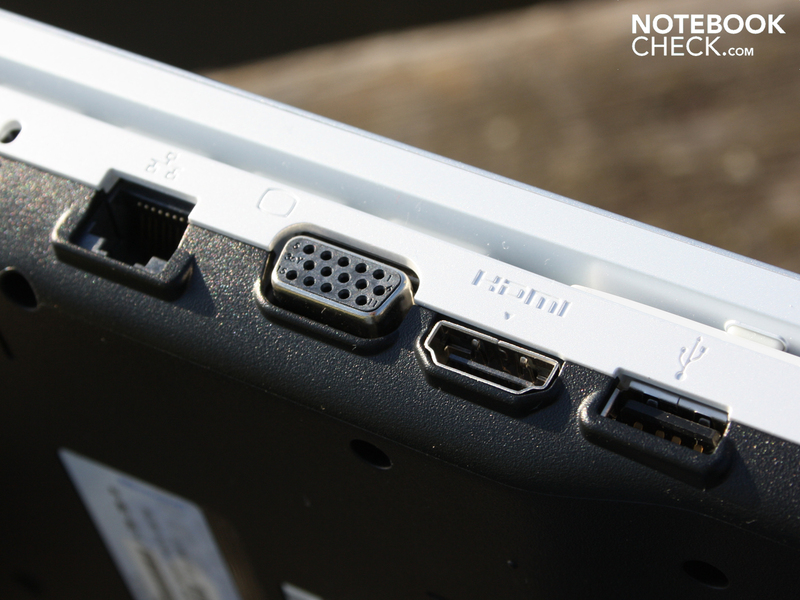 Just only HDMI, VGA, Ethernet and four USB 2.0 ports are supplied. Some will miss USB 3.0, others ExpressCard34 or eSATA. Sony installs two cardreaders on the front so that its own Memory Stick HG Duo can be read in addition to common SD memory cards. This makes sense for the Sony Corporation because HG Duo is the memory card format for its own DSLR cameras, high-end digital cameras and digital camcorder. 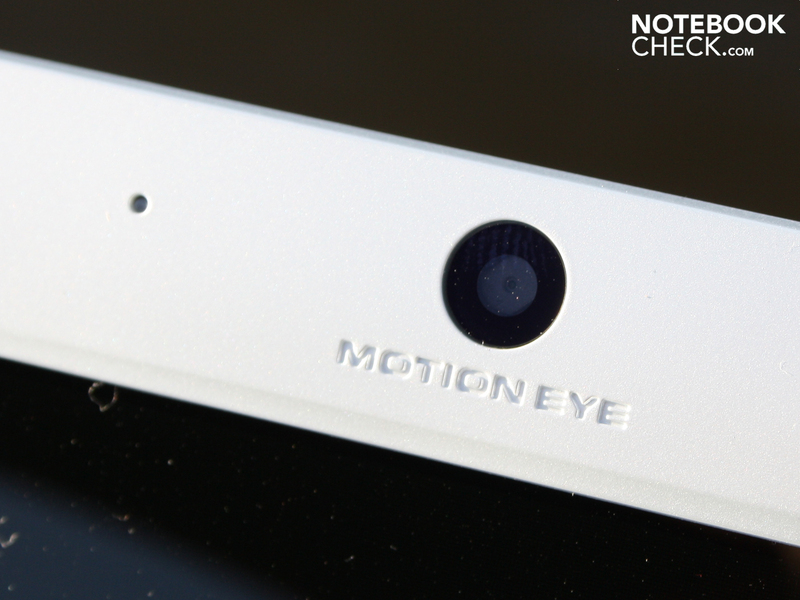 The Motion Eye Webcam's low resolution of 640x480 pixels (VGA, 0.3MP) is a pity. 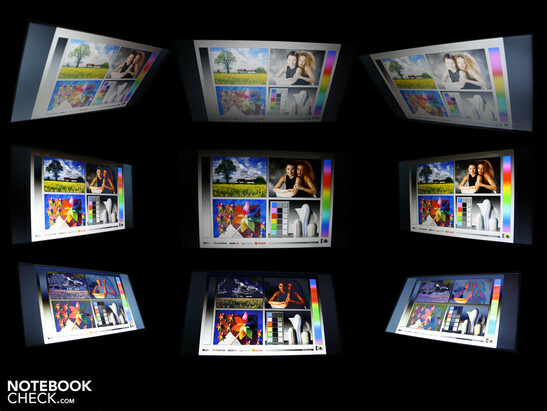 It's disappointing because every inexpensive Acer Aspire can take pictures with 1280x1024 pixels. The interfaces' positioning couldn't be more adverse. 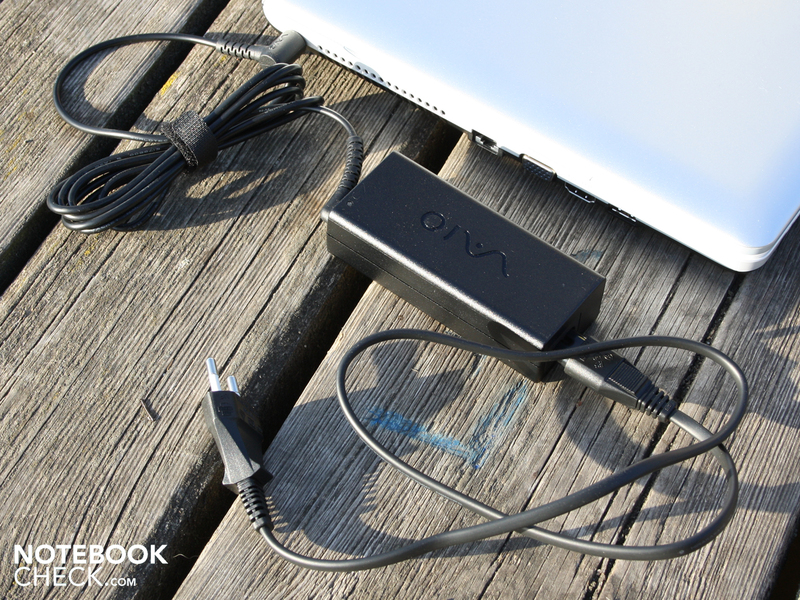 If you imagine the Vaio completely equipped with cables, you'll see drawbacks. A cable harness winds itself across the desk on both sides and deters placing a mouse – no matter on which side. Rear-placed interfaces would have been more practical, but there aren't any. WLAN, in its fastest generation, is supplied by the wireless card in draft n standard (Atheros AR9285). There is no Bluetooth module. The Realtek LAN adapter communicates appropriately in Gigabit style. There are no data carriers. Merely quick start, recovery and service instructions are included. The customer has to burn a recovery DVD for securing Windows Home Premium 64bit in its state of delivery (Vaio Assist). There are many Vaio tools installed on the hard disk. Users who want to remove the superfluous ballast will invest many hours in identifying sense and nonsense of single tools. The Vaio Control Center, the Data Restore Tool, Smart Network and Vaio Update 5 seem to be feasible. 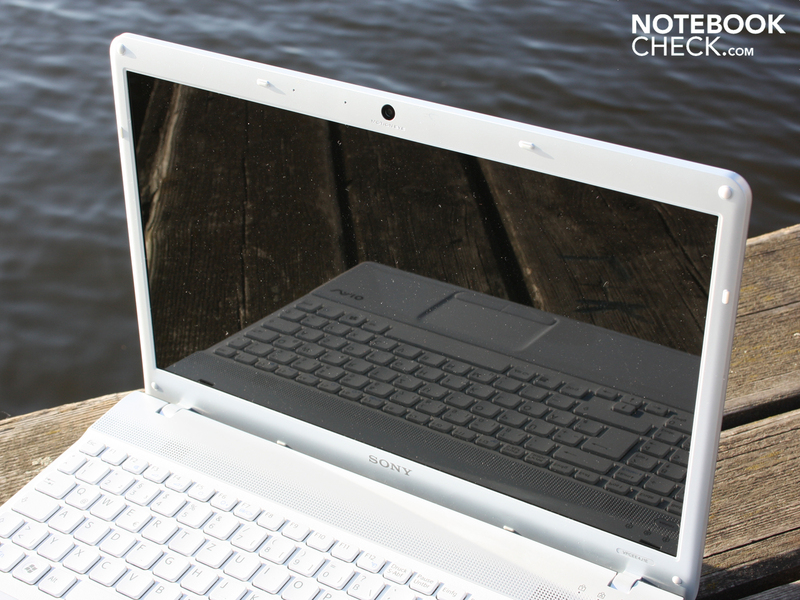 Sony gives a 24 month bring-in warranty for its Vaio. It consists of a 1 year basic warranty plus a 1 year additional warranty. Depending on where it is purchased, the customer should inform himself and, if necessary, secure the 24 months by registering. 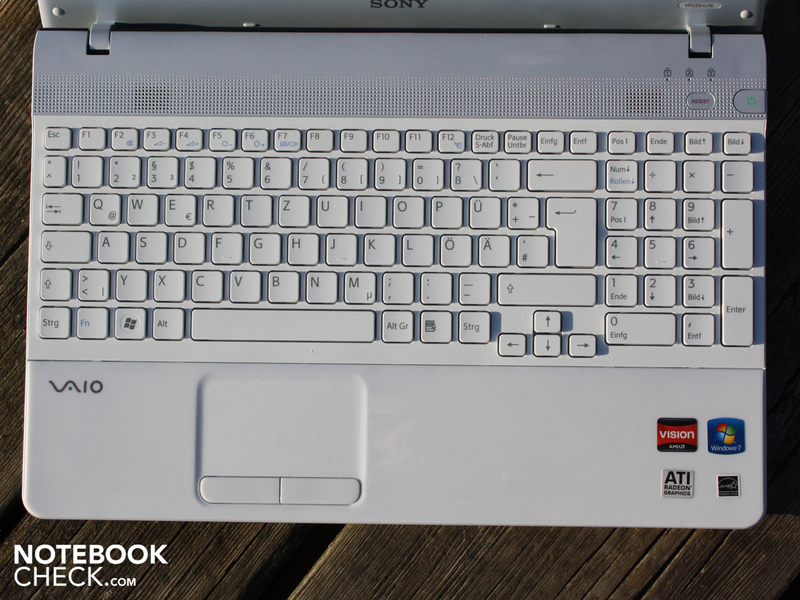 Unusual for the price range and among consumer laptops: Sony has installed a viable keyboard into the Vaio VPC-EE4. 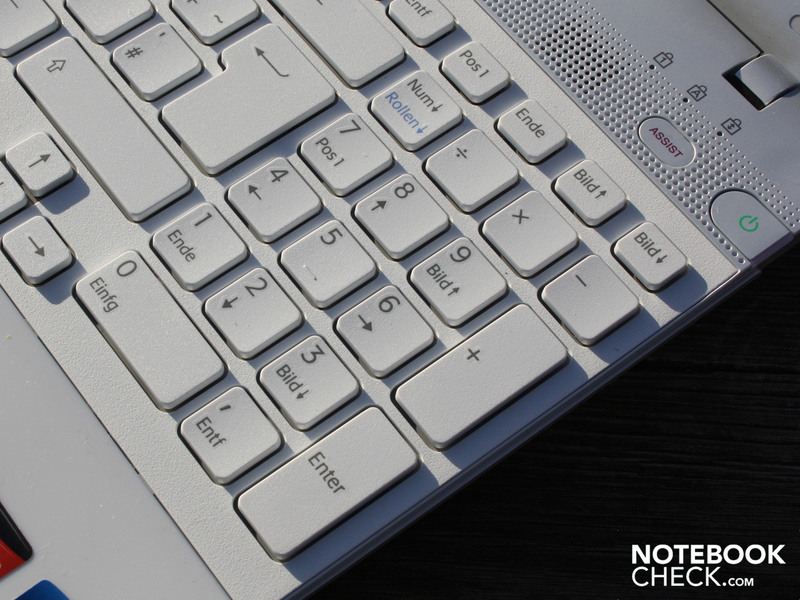 The separate keys exploit the width up to the last corner and the 15.5 inch size allows a standard layout number pad (like in desktop keyboards) to be installed. The accuracy for touch typists is very good because the keys have a conic concavity (almost invisible) besides the non-slip surface, a clear pressure point and a medium key drop. However, the clattery key stroke is a shortcoming. The surface coils evidently on the left and right since it doesn't fit tight. 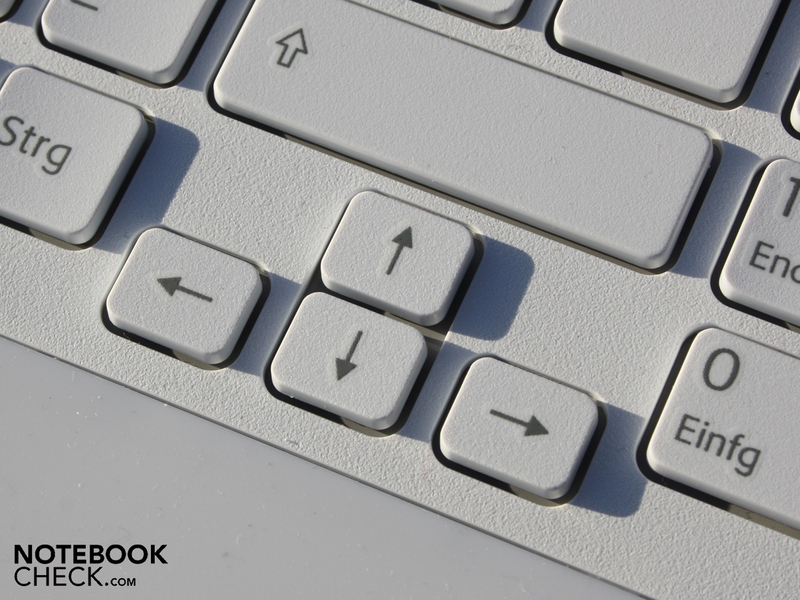 The spatially separated arrow keys beneath the large shift and enter key is a good quality. 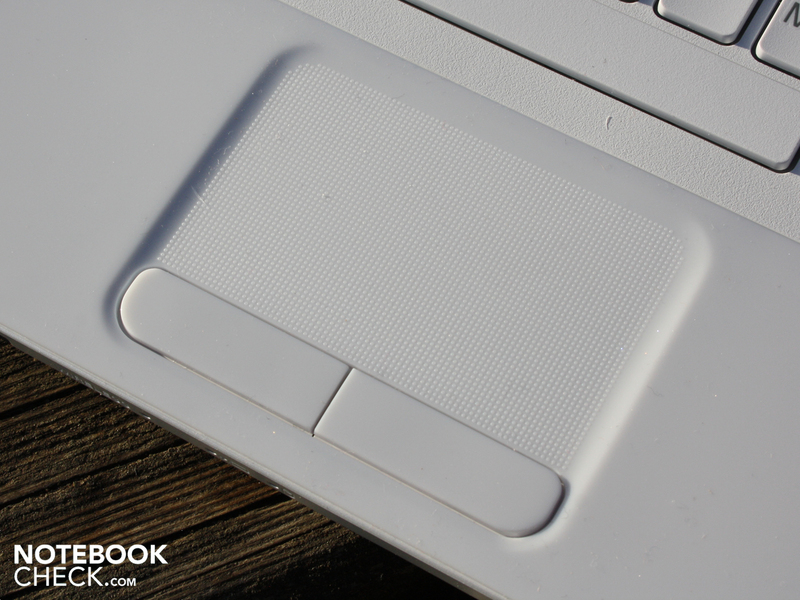 The touchpad is made of the same milky material as the wrist-rest. However, the surface is sprinkled with little knobs. The pad is sensitive up to its edges. A narrow, flat edge divides the touch-surface from the wrist-rest. It is not a multi-touch pad. That means, two finger gestures are not translated into an action. A multi-touch pad would be current standard. The Alps pad doesn't bid according options. The pad's feel during use is pleasant. The finger glides over the knobs without much resistance. The keys have a much too short key drop though and thus provide an insufficient feedback despite their smoothness. The screen can't convince us with its low contrasts and glossy character. We determine a contrast of only 156:1 for the 15.5 inch screen (1366x768 pixels, WXGA). A higher contrast beyond 500:1 would let colors look more vivid. This way, movies and pictures can't develop their full potential. The glare type optically livens up the colors a bit, though. The WXGA resolution is the minimum standard that often meets the limits of overview during work. If you'd like to work without restrictions, you should take a look at the more expensive sister model, VPC-EB4X1E/BQ with Full HD (1920x1080). As expected, the Vaio EE4 doesn't perform miracles in terms of color reproduction and is behind our reference color spectrums (color gamut in ICC profile). A no-go for professionals and demanding consumers. 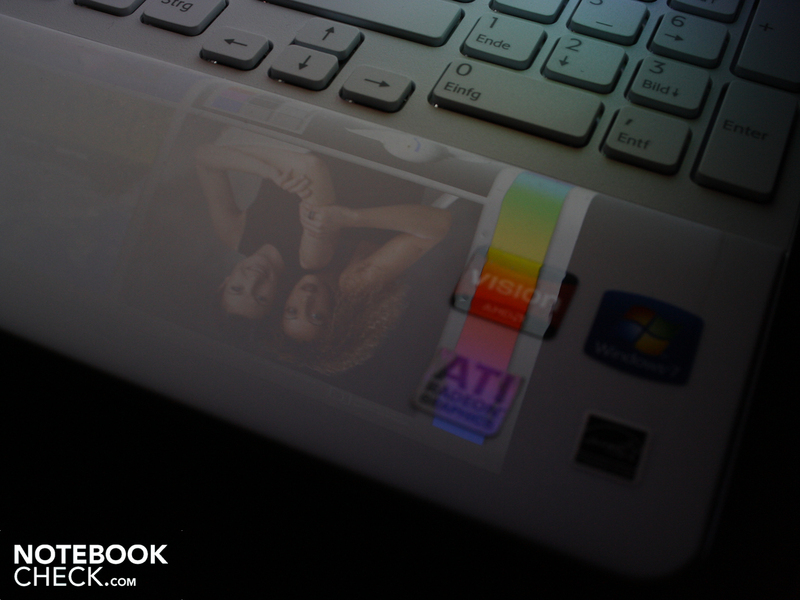 The LED backlight illuminates the screen with an average of 179 cd/m2. There are slight deviations in the corners. The minimum is 164 cd/m2. The varying luminosity can't be seen by the naked eye (homogeneity: 86%). 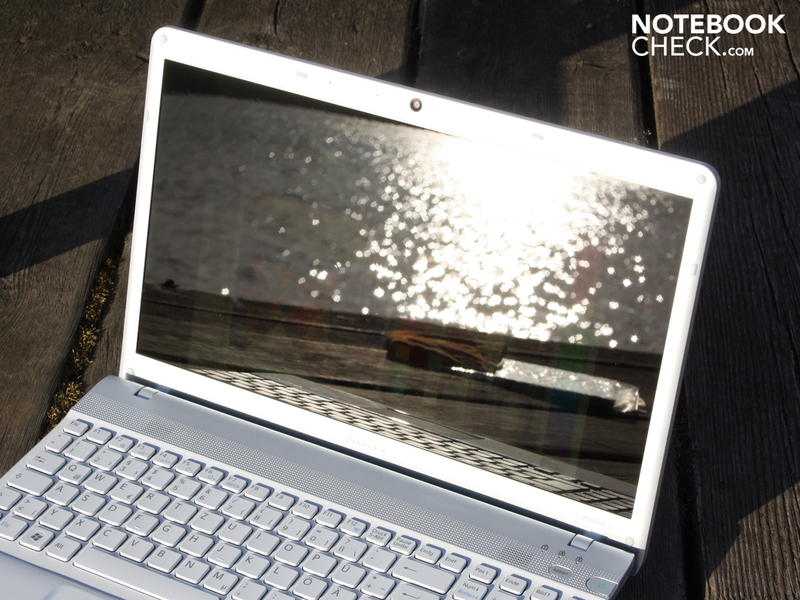 Of course, you'll want to go outdoors with such a stylish, white laptop in the summer because you want to be seen with what you have. The viewer looking upon the glare-type will always have to look out for shade. The reason is the reflections on the reflective screen. In addition, there is the low brightness. We can only recognize a dark picture from the front. We can almost see no writing or colors when looking from the sides. The viewing angles describe up to which deviation a viewer can see unaltered colors and script on the screen. 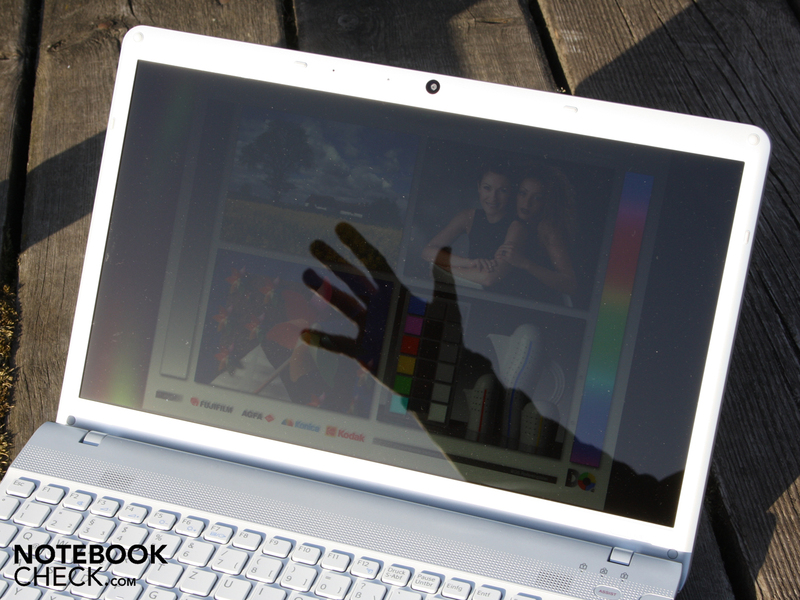 Perfect laptop displays bid a good picture from the side (up to 85 degrees),or up/down views (up to 45 degrees). The Vaio is remote from this. The horizontal viewing angles are low. We can recognize unaltered colors up to a deviation of about 45 degrees from the front. Beyond that, an increasingly intense inversion sets in. When the eyes sway up or down (vertically), the colors already invert clearly at 15 degrees. Sony equips its 15.5 incher with the AMD dual core, Athlon II P360 (2x2.3 GHz). The CPU only has an L2 cache of 1024 KB. The processor, with a TDP of 25 watts, works with the AMD chipset RS880M and is supported by a 4096 MB DDR3 RAM. The dual channel memory controller (DDR3-1066) is incorporated into the processor. The ATI Radeon HD 4200 (IGP) has, according to GPU-Z, a dedicated 256 MB DDR2 memory. That is unusual for an IGP, but possible via SidePort (expensive solution). Since the manufacturer's website speaks of using the main memory, we also believe that the main memory is used (typically up to 512 MB; BIOS: no options). The GPU isn't suitable for the latest games. Its performance is only 11% higher than the Intel HD Graphics (2010 Intel Cores) looking at the standard benchmarks (3DMark06). The HD 4200's actual task is found in the video decoder (UVD 2) for HD videos (MPEG-2, H.264, VC-1). This unburdens the processor. We will compare the Athlon II P360 (2.3 GHz) with Intel's Pentium P6100 (avg. 4318 points) and the 2011 Core i3 processor (i3-2310M, avg. 7448 points) in the processor benchmarks. The Athlon remains at only 4206 points in Cinebench R10's Multi-Core Rendering Test (64bit) and thus moves on a Pentium level. The Athlon removes itself from the shopping list of performance conscience buyers, because the Core i3 opponent is already found in many laptops priced between 430 and 500 euros (MSI A6400, HP Pavilion g6-1032eg, Lenovo B570). The synthetic benchmarks, the like of CB10 & R11.5, don't advocate the Athlon II P360. What about the application performance? We use PCMark Vantage, a test that checks all components in the computer, including the DDR3 RAM, the hard disk and HD 4200. 3167 points is the weak result of this effort. i3-2310M systems (Dell Latitude E5420, Aspire 3750) prove to be faster, no matter in which configuration (4300 to 5761 points). The experienced application performance in use with Web browsers and DVD players is fast and doesn't give reason for hesitation. However, when several applications are being run at the same time, the execution speed drops noticeably. The low PCMark Vantage score is not least due to the slow Hitachi hard disk. The 500 GB HDD reads data from the rotating disks with 65 MB/s in sequential read (average). CrystalDiskMark 3.0's is considerably higher with 83 MB/s, which can be explained by a differing test routine (a difference of 10 MB/s is always there). The HDD first has losses with the poor average access rate of 20.4 milliseconds (see HDTune). Similar HDDs have shorter and thus better rates of 16 to 18 ms here. 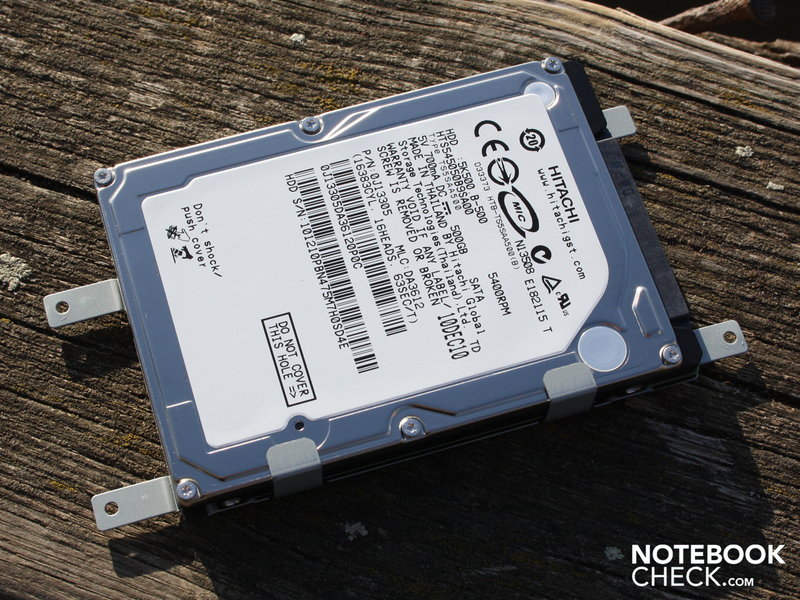 The access rates only bestow the test device with a below average HDD score in PCMark Vantage (2438 points). First faster rotating, 7200 rpm HDDs achieve higher data throughputs, which can result in a HDD score of 4077 points (HP G62-130EG), for example. The Vaio EE4J1E/WI doesn't even try to be a gaming laptop. Nevertheless, we want to illustrate the ATI Radeon HD 4200's limited facilities. We determined a very weak 1465 points in 3DMark06. That isn't a good sign for current games. 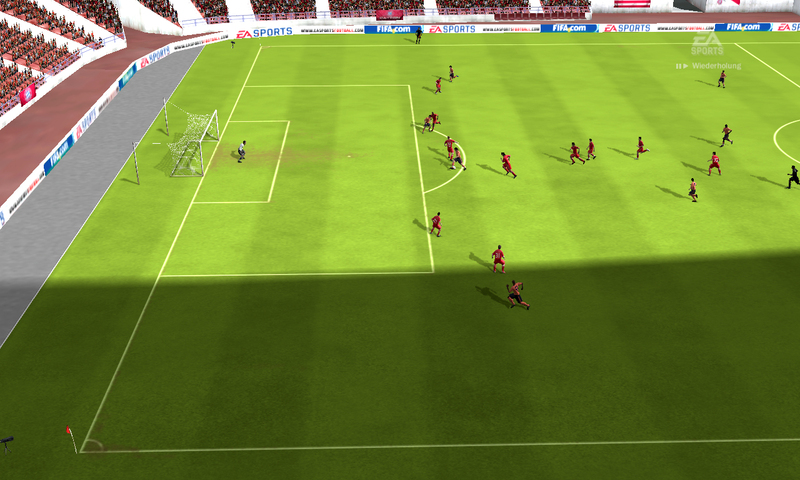 Merely the undemanding game, Fifa 2011, can be played. High details can just still be played smoothly in the native resolution (1366x768). 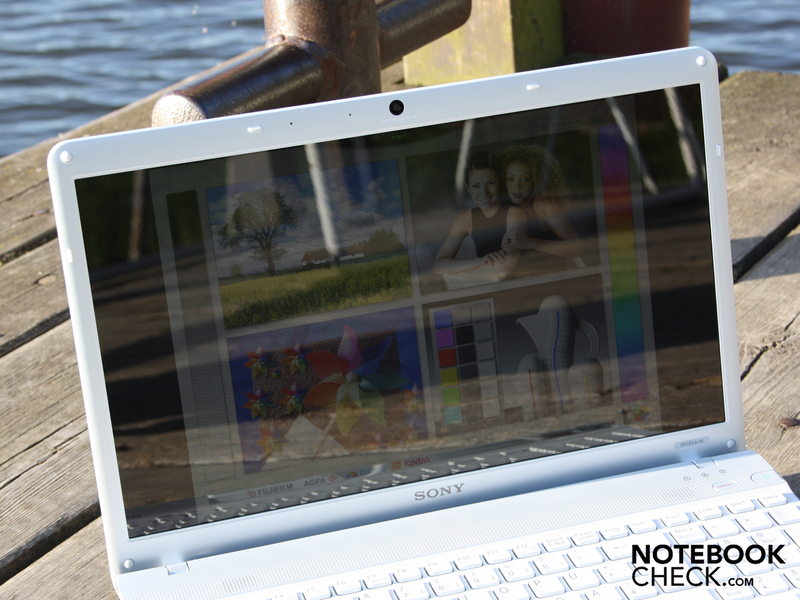 Sony's 15.5 incher shows itself from a pleasant side in terms of noise. The fan turns slowly or shuts down completely during surfing, listening to music or typing. We measure 30.4 dB(A) in idle, which is the rotating hard disk's idle level. The fan's rotation speed increases up to 33.3 dB(A) during short-term load. 3DMark06 doesn't bother the cooling system: 33.6 dB(A). The fan first turns up to a maximum of 35.7 dB(A) when the CPU has to also compute in the usual stress test (Furmark & Prime95). The cooling rotates consistently during this. Overall, the fan management makes a good impression on us. Many users won't even notice the fan during office use. The temperatures continue where the low noise stops. The wrist-rest stays in the light blue area with about 27 degrees. The base plate can reach 35 degrees selectively, but also only in the stress test. Our temperature graph show unalarming rates at all times. The average temperature hardly changes during high load. The collected air is apparently discharged out of the case with a higher frequency than waste air is added. The average of only 28 degrees Celsius (bottom) is due to the large blue fields with rates below 30 degrees. The stereo speakers are above the keyboard underneath a perforated grid. The test device doesn't meet the high expectations on sound. The sound emphasizes the trebles, while midranges and deep pitches are neglected. The installed speaker's sound can't be improved with the audio enhancements (e.g. virtual surround). The volume is very low for the size, but isn't annoying in view of the poor sound. Connecting external speakers or headphones is therefore the best alternative for music consumption. The 3.5 mm headphone jack thus turns into the option of choice. The Intel Core processors from 2010 and 2011 have let the expectation set on battery life in standard laptops skyrocket. 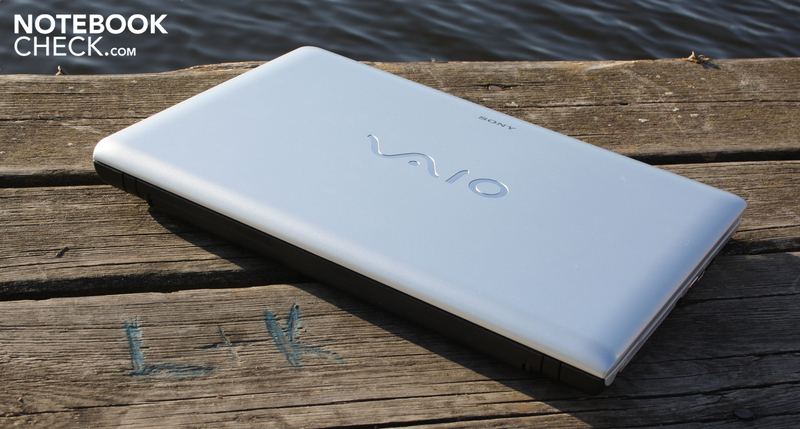 The Vaio thus won't win any prizes with two and a half hours. The weak Athlon II P360 with a TDP of 25 watts demands its toll here. A weak battery of 39 Wh (3500 mAh) is also a reason. The battery runtime during Internet surfing with enabled WLAN is 2:32 hours (152 minutes). Undemanding users can boost the runtime up to 3:13 hours. However, these 193 minutes determined by BatteryEater's Reader's Test are irrelevant for everyday use (idle, lowest brightness, disable wireless modules). The runtime test with a DVD movie strangely only determined 79 minutes (1:19 hours). Normally, the DVD runtime is close to the WLAN time. The battery is first ready for the next movie session after 3:12 hours (recharging:192 minutes). This is a very long charge time for the low capacity. When all energy saving options are exploited and the brightness is set to minimum, the idle power consumption is 13 watts. An average of 20 watts is realistic. This is the 15.5 incher's maximum power consumption in idle (high performance mode). The Vaio EE4 isn't very economic with that. The Latitude E5420 (Core i3 2310M, 2.1 GHz) treats itself to only 10 watts (idle, high performance: 15 watts). The Vaio EE4J1E/WI is on a slightly elevated level for a laptop without a dedicated graphics card. The effective power increases to 38 watts when the HD 4200 is active during 3DMark2006. We determine the maximum power requirement with Prime95 and Furmark during the stress test. The multimeter shows 51 watts in this case. The 65 watt adapter seems to be adequately sized for this. 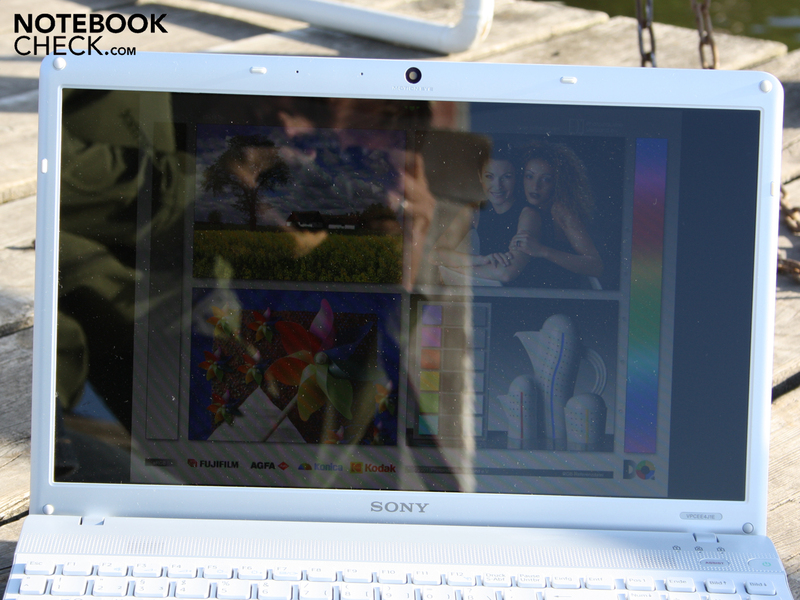 The Sony Vaio EE4J1E/WI with an Athlon II P360 (2x2.30GHz) is a home laptop with low office performance data. 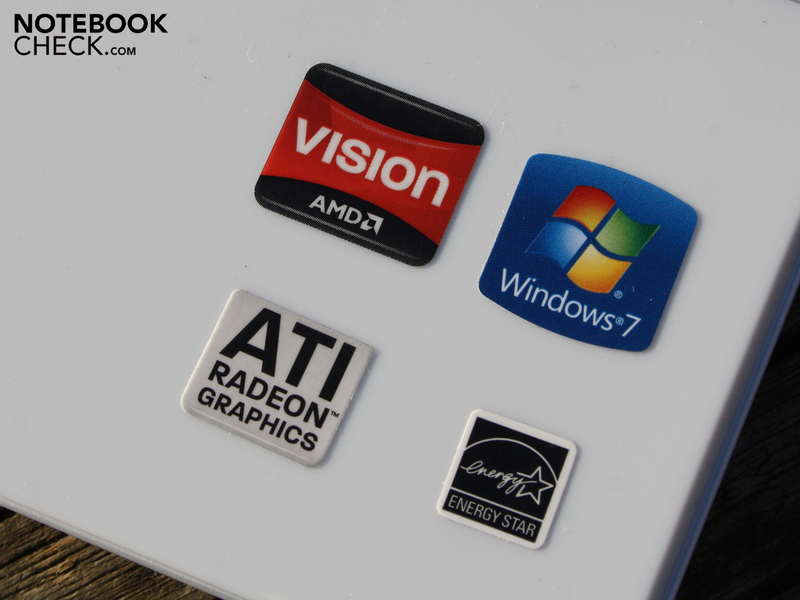 The incorporated GPU, ATI Radeon HD 4200, can only render the latest 3D games in low details and resolutions, if at all. Therefore, if you are serious about gaming, you should look around for at least a HD 6550 or Nvidia GT 540M. The ergonomic key figures are very good (temperature, noise, quiet DVD drive). 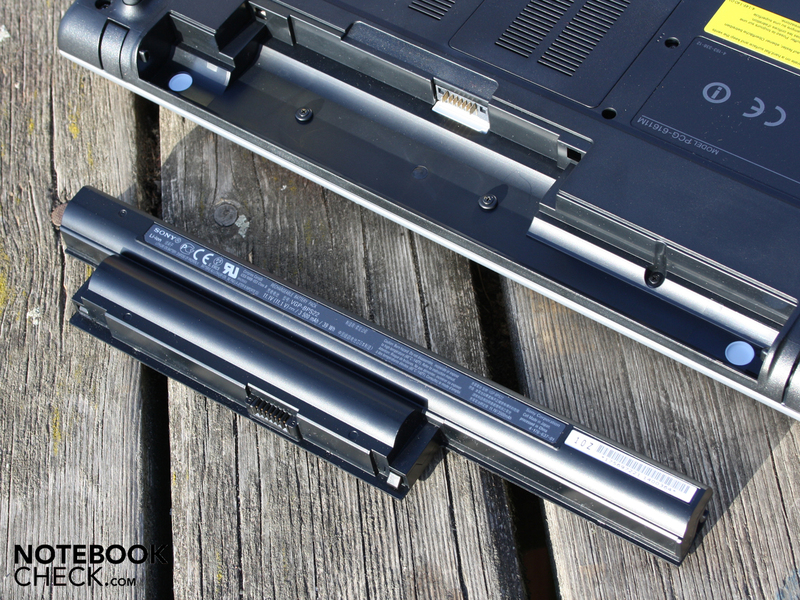 In return, the battery runtimes come too short due to the weak 30 watt hour battery pack. The spongy, because yielding, keyboard unfortunately risks the otherwise exemplary qualities. The layout is only slightly inferior to that of a generous desk keyboard. The pressure point is clear and the keys can be use accurately (conic concavity). A reflective and too dark screen, that makes working in the sun almost impossible and is even annoying indoors, join in on the tight battery life. 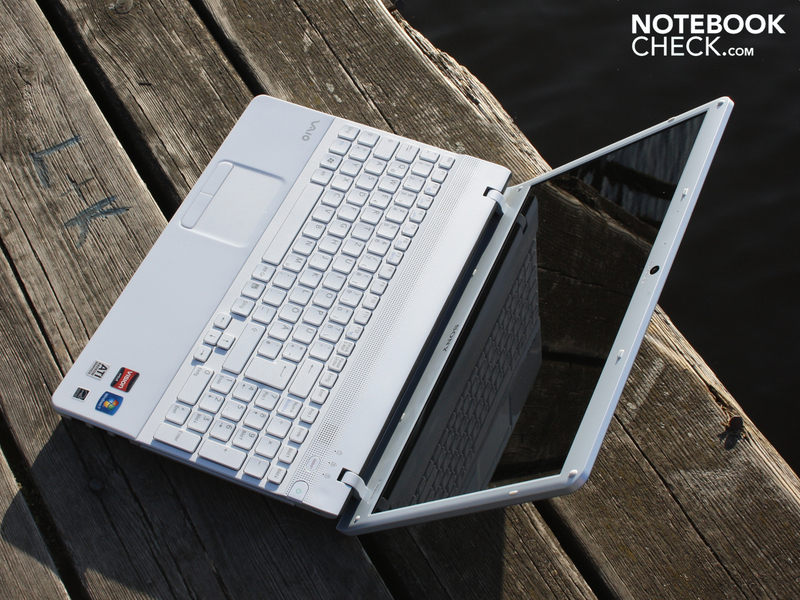 In the end, the Sony Vaio VPC-EE4J1E/WI is a stylish 15.5 incher with low performance. The market environment bids better processors (Intel Core i3) and longer battery runtimes for considerably less than 528 euros. For example, the Fujitsu Lifebook A531 with a 2010 Core i3 starting at 485 euros or the HP Pavilion G6-1032eg with a Radeon HD 6470 and the same CPU for 460 euros. 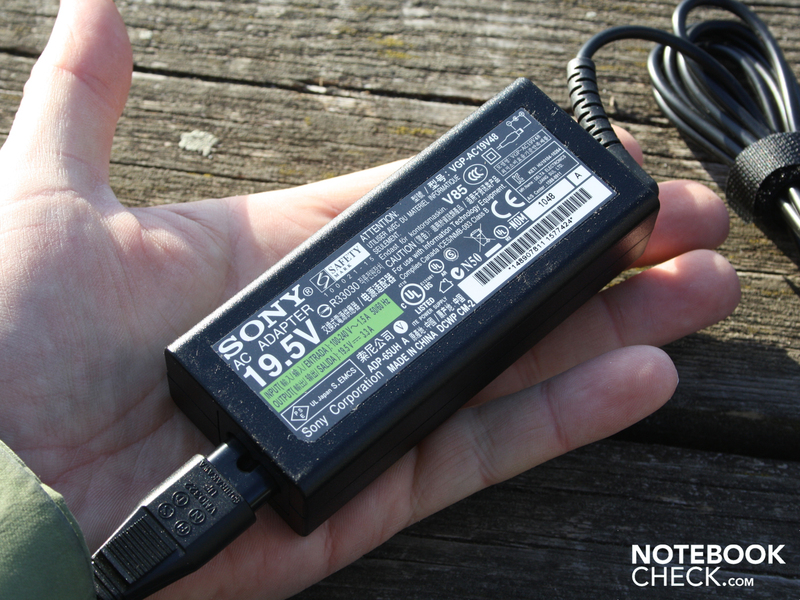 The compact power adapter (215 grams) and the small euro plug hardly take up any room in the bag. The power supply supplies 65 watts, sufficient for a maximum consumption of 51 watts (stress test). The base plate can be opened via two small covers. and the RAM (2 slots occupied, 2x2GB). 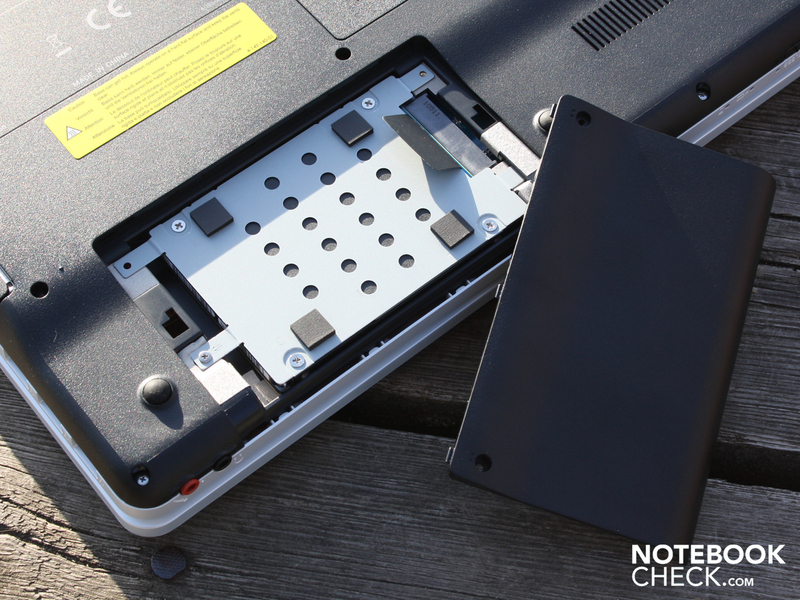 The battery has a capacity of only 3500 mAh (39 watt hours). 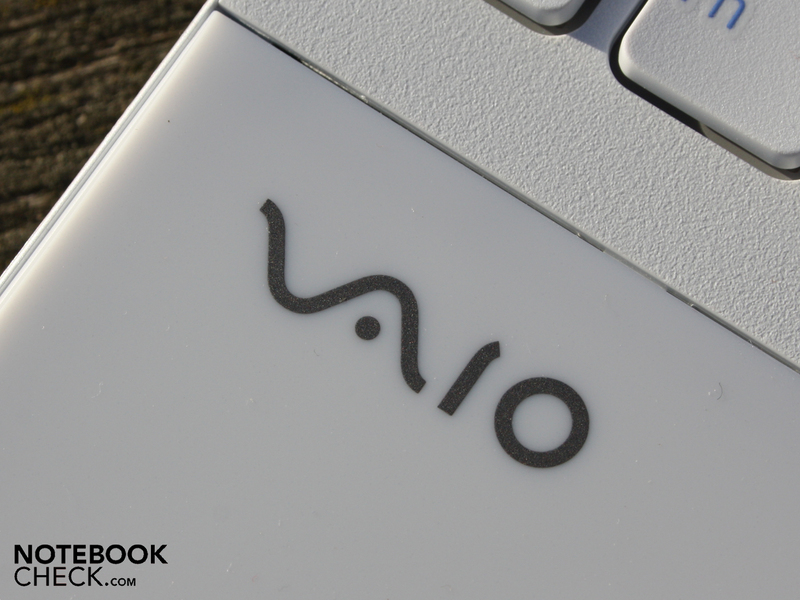 Vaio VPC-EE4J1E/WI: Slippery porcelain looks on the wrist-rest. Vaio VPC-EE4J1E/WI: The AMD equipment computes slower than the Intel alternatives. The reflective display doesn't keep this promise on the Vaio homepage in any way. "VAIO display with high contrast brings multimedia content to life"
that has many configurations to offer, from low-cost (450 euros) to expensive (1000 euros). EE models are, like the test device, equipped with an AMD processor. EB devices are based on an Intel platform. 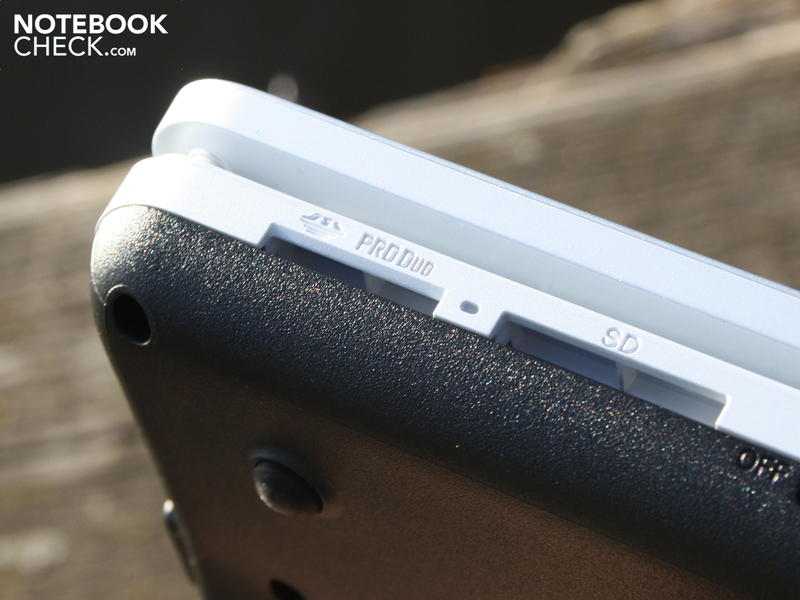 If you're into light colored materials, the 15.6 incher is just right for you. 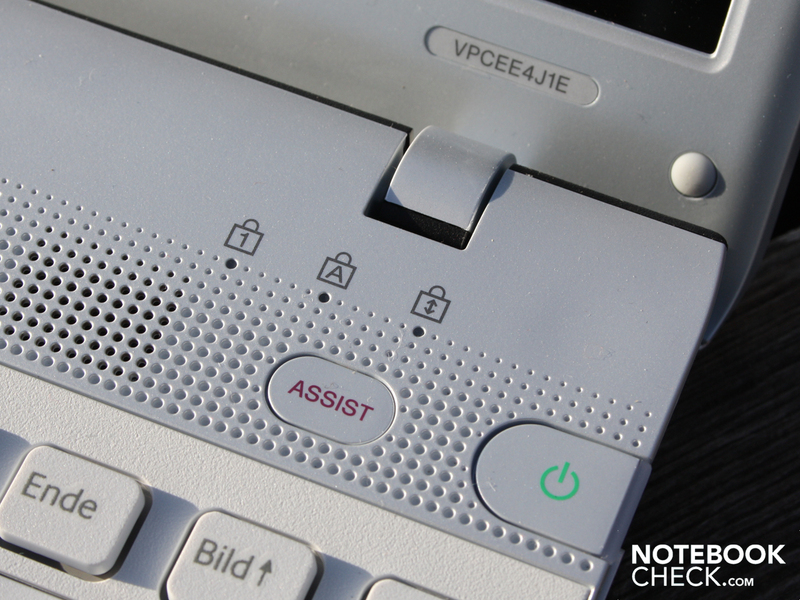 The input devices are perfect for office work, in particular the wide keyboard with its good feedback. and 4 USB 2.0s, HDMI, audio and VGA, only a WLAN switch follows. The round Vaio webcam (Motion Eye) only has a VGA resolution (640x480). Vaio VPC-EE4J1E/WI: White Vaio, available for starting at 528 euros.